Hydrodemolition is fast becoming the preferred method of demolition thanks to meeting today’s stringent health and safety, time and cost requirements. Through the use of robotic machinery, hydrodemolition equipment is now capable of tackling 95% of all concrete-related tasks. So, what makes hydrodemolition the demolition of choice for many? Hydrodemolition is an incredibly efficient process. Compared to conventional methods of demolition, the fast working speed of high-pressure water jetting robots facilitates the completion of all kinds of tasks in next to no time. Thanks to robotic machinery such as the Aqua Spine, hydrodemolition is an extremely versatile form of demolition, capable of completing projects in even the most hard-to-reach areas. In addition, hydrodemolition robots are able to cut through curved as well as flat concrete surfaces with ease. Through the controlled use of high and ultra-high pressure water jets, demolition tasks can be precisely and accurately accomplished, leaving a smooth edge free from burring, deformation and thermal stress. 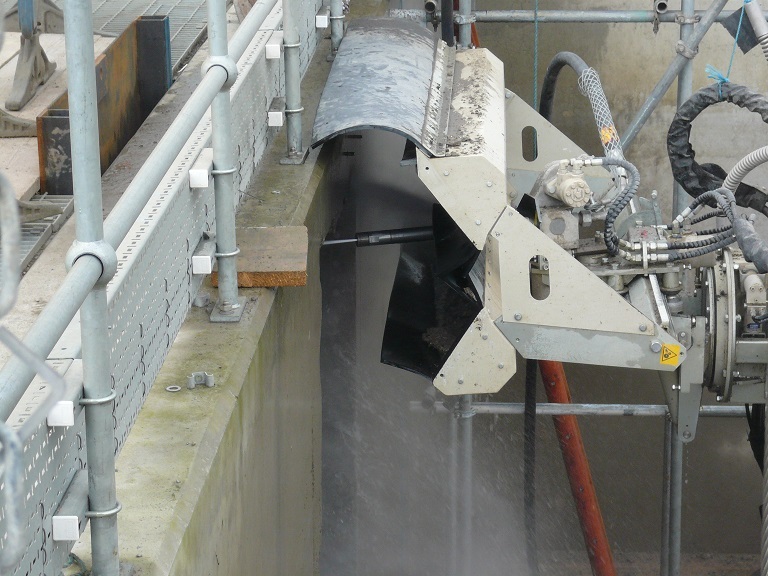 The high level of precision achievable with hydrodemolition means that reinforced concrete structures can be cut without damaging their structural integrity. Unlike other forms of demolition, such as jackhammer demolition, which can compromise the safety of its operatives (HAVS), the high-pressured robotic machinery used in hydrodemolition can be operated from a safe distance, eliminating the risk of injury. A major consideration before undertaking any construction or demolition project is how it will impact the environment. Hydrodemolition offers many environmental benefits, ranging from the reduction of noise pollution to the elimination of potentially hazardous air-borne silica dust and other particles. At Hydroblast, we offer a wide range of hydrodemolition services to meet all of requirements. So, when you next have a demolition project, contact us for a quote.